When we found Andy at the local animal shelter he had some behavior problems. 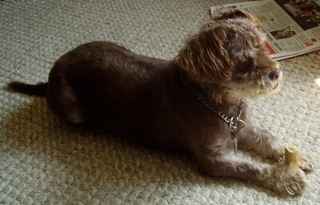 Even so, most of the time he was just a very playful little one-year-old brown terrier. They told me Andy had a reputation of being a “biter.” They said that if I did not adopt him they were going to put him down the next day because he was not the kind of dog who was readily adoptable, and because of a limited budget, the fewer un-adoptable dogs they have to feed – the better for them. As soon as I heard what was going to happen, I thought that was not right for such a young dog so I decided I wanted to at least give Andy a fair chance to survive and live with me and my family so we could try to help him have a good long life in the days ahead. I asked the people at the animal shelter to tell us what they knew about Andy’s history. They said, as a little puppy he was found running around the neighborhood as a stray, eating out garbage cans and barking at everyone. 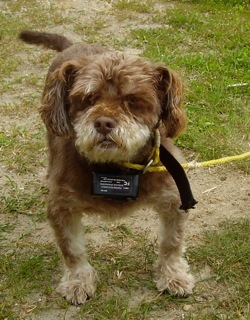 They also said the dog warden had a lot of trouble catching him. When finally caught, he was taken to the dog shelter where we found him. They said even the attendants at the shelter could not go near him because he would always try to bite them. We had Andy for four years and as it happened, I never could totally correct his bad behavior or his biting. During those years he bit my hands several times. It seems to me that during those times he was somehow biting in self-defense because I had accidentally touched some very sensitive part of his body. As time went on he sort of adopted me as “his pack leader” and after awhile, we became buddies. I did not have a lot of time to spend with Andy; so instead, I used to take him with me in the car whenever I went, to the bank, the post office and the grocery store. He loved to ride in the car with me. When I had the time, before a walk, I put a small backpack on him and took him for long walks around the neighborhood. While we were walking I tried to teach him how to walk and behave properly while on a leash. I noticed that the backpack seemed to make Andy feel special for some reason. You see, as soon as that backpack was strapped on Andy he would walk without pulling on his leash. He soon learned to follow my commands. As time went on I discovered that wearing that backpack seemed to give Andy a sense of responsibility and worth. In fact, every time he saw me take the backpack and his leash off of the hook, he got very excited, stood still and quietly waited while I fastened it on his back with no biting. He just loved to wear his backpack and be able to do useful work. Over time, I was able to teach him to “heel” and to walk quietly beside me, with no pulling. I taught him to stop – at my command – at every cross street, and to sit and wait for me to say: “OK.” After awhile, he would automatically sit at every cross street with no commands from me. A few months ago Andy became quite sick with allergies and ear problems. He often acted like he was in pain as he shook his head and tried to scratch the inside of his ears with his toenails. We tried to put ear drops in his ears but the only way we could do that was by putting a muzzle on his face so he could not bite us. When I finally took Andy to the veterinary hospital for an examination, all of the staff told me that in their professional opinion Andy had some internal and invisible injury or sore spots that, when touched, made him react by biting whoever touched him. In short, the vet did his best to help me understand that to put Andy “down,” was the best way to help Andy and to stop his painful suffering. Even now, months later, I can say thanks to everyone at the vet’s office who helped me make the decision to end Andy’s life – acceptable and understandable for me. It was not an easy decision, as you would know if you had seen my tears as I held Andy on my lap and watched him go to sleep and then sort of fade away and leave this world, but I’m sure it was the best decision for my friend –my dog Andy. 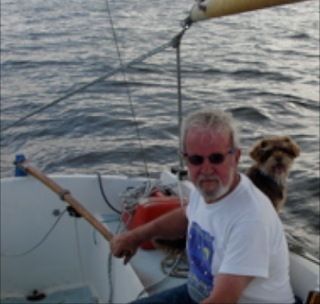 REMEMBER: Doggy Tales is reader contributed. If you have, or have had, a finned, feathered, or furry friend you were fortunate enough to share your life with, we want to hear about it! Leave a comment here with your addy where I can contact you, or click the FaceBook link (right hand side of this blog) and send me a PM. Your article will be featured in a future Monday segment. What a wonderful story of dog love. Andy was a gem in the rough and you gave him a chance to enjoy life, even if for a short time. What a touching story I'm so glad you were able to give Andy a chance, and love and happiness for his short life. It's heartbreaking to have to make the decision to end a beloved pet's life, but in the end the last loving act we can do for them is end their suffering. You gave him four years of affection and care he would otherwise never have known - and his story proves animals never act aggressively without a reason. I'm so sorry, Terrance, to hear that you had to put down your little doggie. I know what that's like and it's never easy. But, as you say, you will be reunited with him and go for some extraordinary walks some day in the future. My first response may not have been published. I appreciate your helpful comments about Andy. He continues to life in my heart. Only this time there is no pain. That was my final gift to him. My heart goes out to poor little Andy. I'm glad he found someone to love him before he left this world. Sorry guys. Can't type a real response. I can't see the screen through the tears. A beautiful story of love and trust between a man and his dog. Little Andy's life may have started out bad, but it had a happy ending.